Discover The Webinar Lifestyle With High-Converting Webinars! 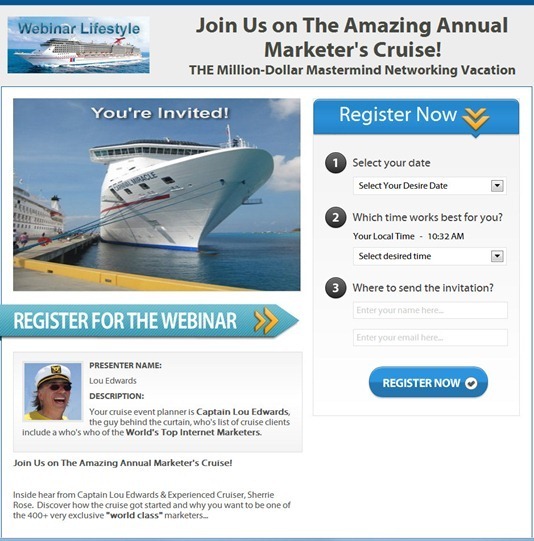 Enjoy this Must Attend Webinar and tell me you are not tempted to join us… we’ll see you on the cruise! Here’s a snapshot of the webinar registration page. Click the image to go to the registration page. The Webinar Lifestyle includes perpetual profits in the form of ENCORE WEBINARS. Once you have conducted a great, high-converting webinar, you want to benefit from sharing it multiple times. A webinar is an event and unlike an on-demand video, it deserves to be treated with respect. Giving your webinar attendee the option to choose a date and time so they can add the event on their calendar respects their schedule. Those people who did not sign up for the original live webinar did not get a replay link, so the webinar is a new event, a new experience for them. Treat it like you would promote any new webinar. Unlike replay webinars that turn into sales videos with no respect to the time or schedule of the viewer, when you treat a webinar as an event like the experience is so much better for the participant. Develop better relationship riches with your customers and prospects by respecting their time. Webinar events get on the calendar and automated webinars provide a nice, perpetual profit stream as long as the subject matter is current.